This "pretty in pink" stack of tea cups is the last design in my Tea Party Invitation series. This stamp set is the "A Nice Cuppa." It is also bundled with the "Cups and Kettles" thinlits. "Birthday Bouquet" Designer Series Paper coordinates the color palette into one sweet card design. I used the Wink of Stella Clear Glitter pen to fill in the font on the tea cups. It adds such a pretty sparkle to every project. Thank you for joining me for this Tea Party Invitation series. My next post will let your vote for your favorite design and reveal which one was chosen by my customer for her event. 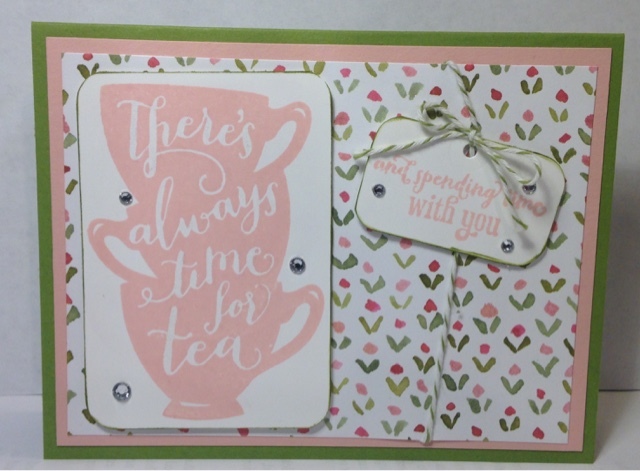 Supplies for this card are linked below so you can get creative with your own ideas at home. Please leave comments and let me know what you have liked in this series. Thank you for stopping by!